Whether it’s providing thousands of diapers to needy families, fresh produce grown in a synagogue garden, support for sick children, or friendship for those with special needs, in the Jewish community, service that continues year round often begins with the inspiration of the new year. Anshe Emeth Community Development Corporation (AECDC) was launched by Anshe Emeth Memorial Temple in New Brunswick as a separate charitable entity in 2001. Housed in the Reform synagogue, the AECDC has several programs: H.E.L.P (Health Equipment Loan Program); Food Funnel, which donates to food pantries and soup kitchens and delivers needed food to the elderly, poor, and disabled who do not have access to transportation; and the Central Jersey Diaper Bank, which distributes disposable diapers, car seats, baby formula, wipes, and other essentials to needy families. The diaper program is one of the most critical services. “We gave out over 120,000 diapers last year to over 800 families,” program coordinator Adam Cohen said. It’s a necessity, he added, often overlooked in government and most charitable programs. Disposable diapers can cost $100 a month per child, and many laundromats don’t allow the washing of cloth diapers. “If you cannot afford to supply disposable diapers for day care, that impedes your ability to hold down a job,” he said. “If you cannot get a job because you cannot afford to put your children in day care because you can’t supply diapers, then you’ll never be able to afford diapers. For the elderly or disabled, the H.E.L.P. program loans walkers, wheelchairs, shower seats, and other medical equipment, and will assist those in need of hospital beds. Through its Food Funnel program, AECDC donates needed items to Elijah’s Promise soup kitchen in New Brunswick and food banks in Franklin, South Brunswick, and several other providers in Middlesex and Somerset counties. It also distributes bags of such staples as peanut butter, cereal, tuna, and pasta directly to needy families. Volunteers deliver the food to those who have no transportation or are disabled. Most of those making deliveries are high school students from New Brunswick who volunteer through the New Jersey Youth Corps work/study program. The AECDC also runs a Wishing Well program around the holidays that provides 80 families with gifts in response to requests, including clothes and toys, said Cohen. Bikur Cholim of Raritan Valley has a corps of several hundred volunteers from Highland Park, Edison, and East Brunswick who visit Jewish patients at Robert Wood Johnson University Hospital and Saint Peter’s University Hospital in New Brunswick, JFK Medical Center in Edison, and ProCure Proton Therapy Center in Somerset, as well as residents of area nursing homes. Bikur Cholim volunteers also drive community members to medical appointments and family members without transportation to the hospitals. They prepare and deliver kosher meals to sick, disabled, elderly, and homebound residents and to families of women who have recently given birth. Through the Bikur Cholim hotline, callers may request for others to say tehillim, or prayers to induce healing on their behalf. Medical equipment — including canes, wheelchairs, crutches, shower and tub chairs, commodes, and breast pumps — are available for loan. In addition, said Bikur Cholim co-president Dawn Botnick of Edison, “We have lockers and rooms in various hospitals stocked with books, tapes, electric candles, siddurim [prayer books], and food” for patients and family members, especially for Shabbat stays or visits. The organization has also partnered with the Chaim V’Chesed Guest House, the 24-hour hospitality center across from the Robert Wood Johnson hospital, where visitors to patients can find a place to eat and rest. Bikur Cholim also arranges Shabbat hospitality in Edison and Highland Park for family members visiting hospitalized relatives over the holidays. For those hospitalized over the holidays, Botnick said, volunteers will come to conduct a Passover seder, read the megillah on Purim, or blow the shofar on Rosh HaShanah. Electric menorahs are available for Chanukah. Bikur Cholim launched approximately 25 years ago “with a small group of women doing different things for a family or two that needed help, and now it’s grown into this tremendous organization,” said Botnick. While most volunteers are women, Adler said, there are male volunteers who serve as drivers and perform ritual functions. 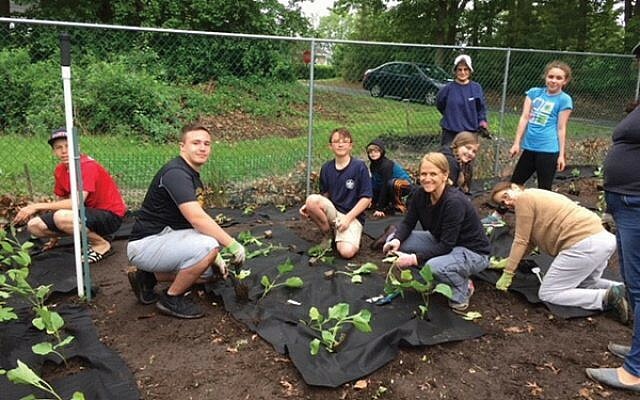 The Gan Tikvah Community Garden is a project of Temple Beth Ahm and Temple Shalom in Aberdeen and the Matawan United Methodist Church, which joined forces to create a source for fresh produce to be delivered twice a week to the church’s food pantry. 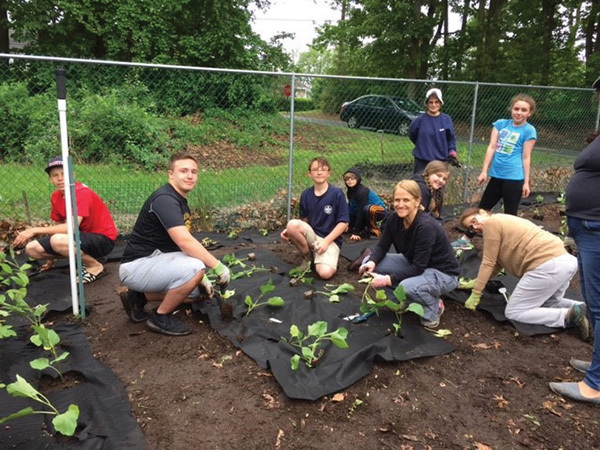 The garden, located at Temple Shalom, was started in 2010 and is cultivated mostly by congregants of the two synagogues with help from church members, members of the Boy Scouts and Girl Scouts, and other volunteers. Kaplan said gardening begins in the winter with the Soda Bottle Project, through which seeds for lettuce and Swiss chard are planted in empty bottles and kept moist outdoors, so that “come April, we have beautiful little plants to plant.” The supply of vegetables continues into the fall. “We wanted to help feed people, and those who receive our vegetables are very happy because they usually don’t get fresh produce at the food bank,” said Lenore Robinson, who until recently was social action chair at the Reform Temple Shalom. Kaplan said she was told by the woman who runs the food pantry that some people come specifically for the fresh produce. “They are so grateful for it,” Kaplan said. The teens come from the surrounding communities, including Little Silver, Fair Haven, and Rumson, and most are public school students. 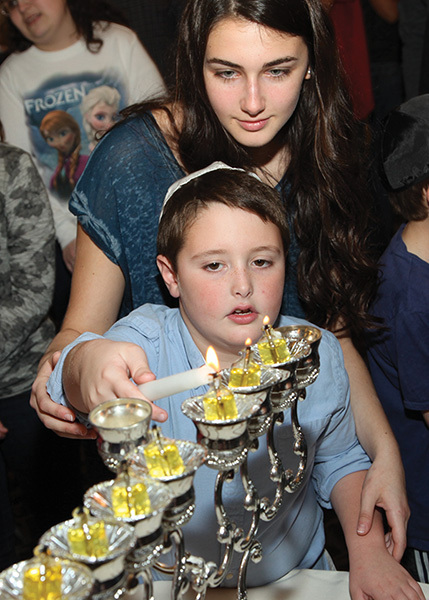 While all the volunteers are Jewish, the young clients are not necessarily. The only requirement is that the child be from Monmouth County. Hand in Hand screens the volunteers and provides them with training. Greenberg said each year one training session features a doctor or teacher or other professional who works with special-needs youngsters. 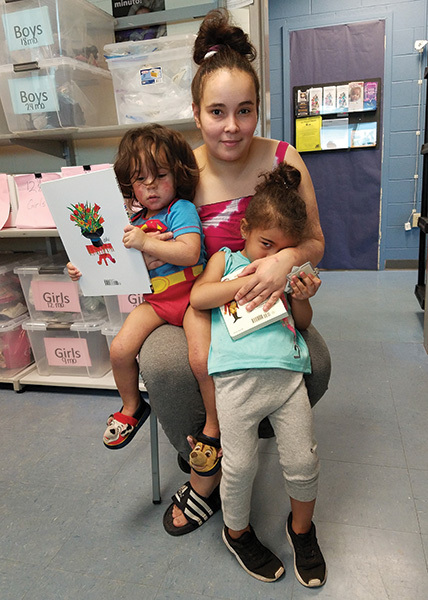 Speech-language therapist Bernadette Mullen, a special education teacher and operator of a practice for youngsters with challenges, serves as an adviser whom the teens can turn to when in need of support. Many of the volunteers spend four years with a particular child, said Greenberg, and often friendships continue long past that. Friendship is something sorely missing in the lives of many special-needs children, said Greenberg. He recalled one mother of a challenged youngster who said she was “literally on the verge” of offering to pay parents to have their child come over to play with hers.